Benirsch, K., D. H. Wurster, R. J. Low, N. B. Atkin. 1970. Chromosome complement of aardvark, Orycteropus afer. Chromosoma 31:68-&. DeJong, W. W., A. Zweers, and M. Goodman. 1981. Relationship of aardvark to elephants, hyraxes and sea cows from alpha-crystallin sequences. Nature 292:538-540. Melton, D. A. 1976. 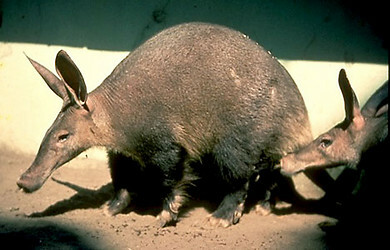 The biology of the aardvark (Tubulidentata, Orycteropodidae). Mammal Review 6:75-88. Nowak, R. M. 1999. Order Tubulidentata. Pages 1048-1049 in: Walker's Mammals of the World. Sixth Edition. Volume II. (R. M. Nowak). Johns Hopkins University Press, Baltimore. Pathak, S., L. Shirley, M. L. Johnson. 1980. The chromosome-banding patterns of the aardvark Orycteropus afer (Tubulidentata, Orycteropidae). Experientia 36:547-548. Patterson, B. 1978. Pholidota and Tubulidentata. Pages 268-278 in Evolution of African Mammals. V. J. Maglio and H. B. S. Cooke, eds. Harvard University Press, Cambridge, Massachusetts. Pickford, M. 1996. Tubulidentata (Mammalia) from the middle and upper Miocene of southern Namibia. Comptes Rendus de l'Academie des Sciences Serie II Fascicule A-Sciences de la Terre et des Planetes 322:805-810. Shoshani, J., C. A. Goldman, and J. G. M. Thewissen. 1988. Orycteropus afer. American Society of Mammalogists. Mammalian Species Account 300:1-8. Thewissen, J. G. M. 1985. Cephalic evidence for the affinities of Tubulidentata. Mammalia 49:257-284. Thewissen, J. G. M. and D. M. Badoux. 1986. The descriptive and functional myology of the fore-limb of the aardvark (Orycteropus afer, Pallas 1766). Anatomischer Anzeiger 162:109-123. Order Tubulidentata. Animal Diversity Web. University of Michigan Museum of Zoology. Tubulidentata. The Ultimate Ungulate Page. 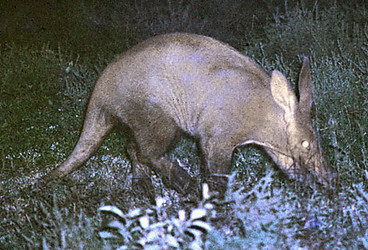 Aardvarks are shy, solitary and completely nocturnal. They sleep in burrows by day and emerge to dig for termites after dark. This one was found by spotlighting on open grasslands.